Galleria Consadori features “Progetti a confronto”, an exhibition that compares the project by Claudio Salocchi, Carla Venosta and Gianfranco Farioli. Opening: Saturday 14th April 2012.
design as an evolutionary idiom and stimulus. Three protagonists of Italian creativity explore three different approaches to designing, prompting a new view of the very concept of design. 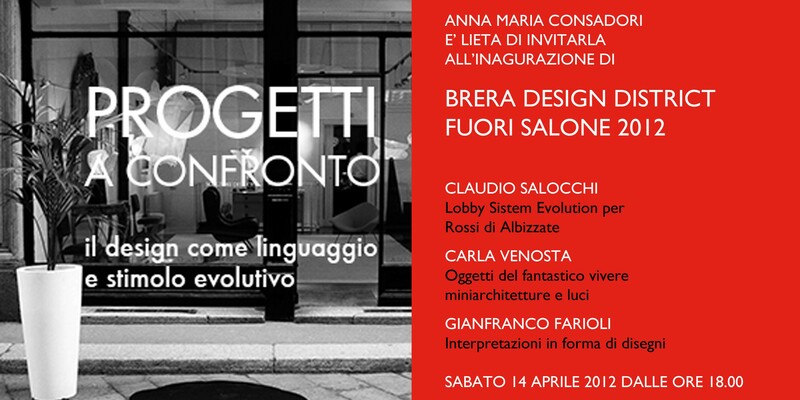 Within the ambit of the Fuorisalone 2012 events, on the 14th of April an exhibition with multiple interpretative keys will be opening at the Anna Maria Consadori Gallery. The attractive space at N. 2 Via Brera will be featuring the new interiors line created by Claudio Salocchi for Rossi di Albizzate, the Lobby System Evolution (from the chromosome of the Lobby sofa from 1986 to the present day’s coordinated furnishings); the exhibition will also feature Carla Venosta’s “objects of fantastic living”, including the centre-piece Simmetria bianca, the fish-sculpture Merlino and the Geometria di una stella lamps. On the walls, in an ideal parallel, will be the works of Gianfranco Farioli, inspired by those creative ideas and translated into his original iconic alphabet. In short, three design approaches with a strong authorial and non-complementary characters, yet usable both as single explorations and as an empathetic complex capable of opening paths that intersect in the cultural terrain of each individual visitor.